Café Scientifique Welcomes Non-Fiction Graphic Novelist Jim Ottaviani Schuler Books has teamed up with the Lansing Community College Science Department to bring you Café Scientifique, a monthly science discussion group. This month we are pleased to wel-come back Ann Arbor non-fiction graphic novelist Jim Ottaviani! The last time he visited us we talked about his graphic biography Feynman, about physicist Richard Feynman. This time we’ll be looking at his new book Primates: The Fearless Science of Jane Goodall, Dian Fossey, and Biruté Galdikas. Illustrated by Maris Wicks, Primates is an accessible, entertaining, and in-formative look at the field of primatology and at the lives of three of the most remarkable women scientists of the twentieth century. These three ground-breaking researchers were all students of the great Louis Leakey, and each made profound contributions to primatology—and to our own understanding of ourselves. 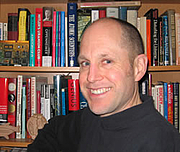 Jim Ottaviani is currently considered a "single author." If one or more works are by a distinct, homonymous authors, go ahead and split the author. Jim Ottaviani is composed of 3 names. You can examine and separate out names.